Killswitch, Soda Slope, or P.Slope as a "One bike"
Discussion in 'BMX & Dirt Jumping' started by Dirtjumper999, Nov 6, 2012. Been getting bored with Park and riding a lot more of the mountain side lately. 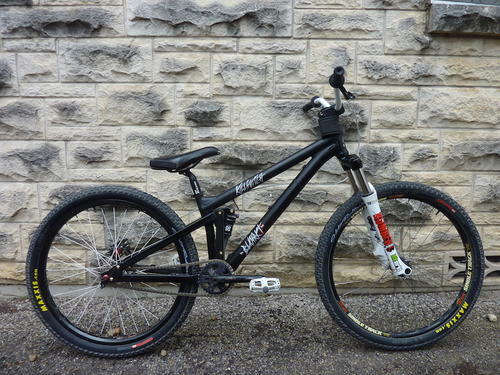 Trying to decide on an only bike for 2013. I lead XC rides for my shop, and will be doing that a lot, but I have more fun riding XC on my ss dirtjump bike than my XC bike. Playfulness is worth more to me than a cushy ride. I ride dirtjumps a lot during the winter. So here is my singleplan, build up a short travel-playful frame, possibly singlespeed, with two seatpost combos, one height adjust seatpost/seat to slap on for XC, another pivotal seatpost/seat to put on for jumping. So, who has built up a similar type of bike? Does it work? I think too much. Help me obi-wan kanobi, you're my only hope. Would love to hear a real review of the P-Slope but your gonna need some kinda dropper seat post. I have a buddy that uses the Killswitch as his XC,DJ,Park bike and really likes it. If you prefer riding a DJ on your XC rides then any of them will be ok. It will just come down to geometry. The P.Slope I believe is suppose to be very similar if not exact to the P.3. I rode a P.3, P.2 and P.1 for a bit but have never really felt comfortable on any of the P series bikes. But again that's personal preference. The NS Slope is pretty close to the Transition Double which I rode for a while as well and really liked it as a short travel bike to play around on. My vote would be between the killswitch and the Soda Slope. If you are going to keep it single speed primarily I would get the Killswitch because of the linkage design you wouldn't have to use a tensioner. Not a major thing but worth noting. I ride a sinister gruitr set up like that kinda. 1x9, burly wheels, xc rear tire, full seatpost, 160 brakes, 140mm fork, 4.5" rear travel. Probably 30 lbs. Does big jumps or big climbs with basically the same setup. stuff i change out is tires, pedals, and sometimes stem to a 70 for a really long ride. the bike is not great in the chatter or dh stuff but it can hang. Kinda 4x/slopestyle Is a great way to set up a bike, makes for a really versatile bike if youre a jumpy type rider that does big rides too. just might want to think about having 2 wheelsets, one lighter more xc/trail oriented set with 2.3 knobbies and one heavier set with dj type tires. and a 36 talas or lyrik. However My gruitr could not replace a real dj hardtail or dh bike so I am kinda stuck keeping a quiver. Don't the killswitches pedal like crap from the concentric bb? I would consider selling my Killswitch (size L). PM me.